Marcus Morris is a confident guy. 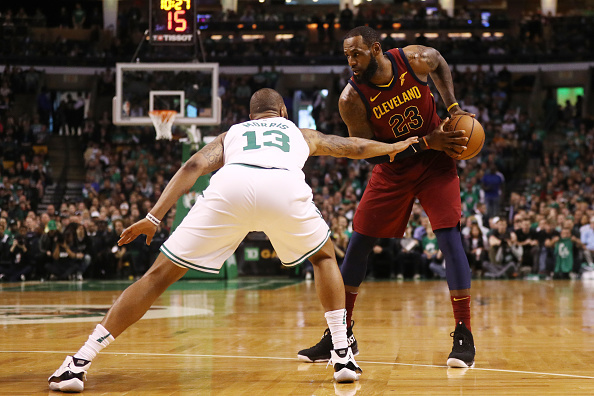 The Boston Celtics forward was faced with the daunting task of trying to slow down LeBron James in the Eastern Conference Finals, so he looked back at James’ two previous series to get some tips. He wasn’t impressed with the Toronto Raptors or Indiana Pacers effort. Through 7 games against the Indiana Pacers and four against the Toronto Raptors, LeBron James averaged 34.2 points on 55.3 percent shooting from the field with nine assists per game. Just gaudy numbers for a guy in his 15th season. In Game 1 of the Eastern Conference Finals, the Celtics contained LeBron with several defenders, which led to him only scoring 15 points on 5-of-16 shooting. He also recorded seven turnovers to nine assists, and the Cavs were down by more than 20 points for much of the game. Given his past, it’s never a good idea to poke the sleeping bear that is LeBron James.